We are a business committed towards environmental sustainability and we ensure that our operations are done with the least amount of reasonably possibly environmental impact. Marking the World Environmental Day 2016 which fell on the 05th of June, we embarked on an initiative to measure, manage and mitigate our environmental impact. This was carried out by means of assessing our Carbon, water and waste footprints. 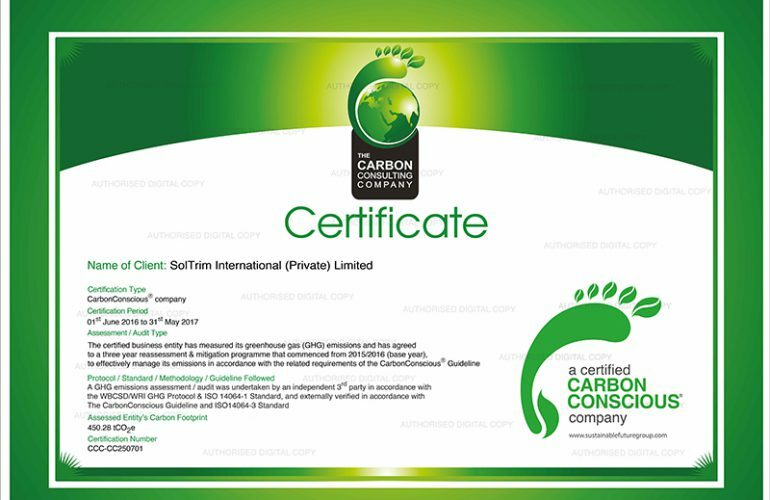 Our efforts were recognized by The Sustainable Future Group (www.sustainablefuturegroup.com), who serve as a sustainability verification and certification body, and we are honored to have been awarded the CarbonConscious® and WasteConscious® certifications under this program. All of the assessments performed were carried out by The Carbon Consulting Company (www.carbonconsultingcompany.com). Not letting this initiative be limited to a single day, we will continue to strive in making eco-conscious decisions that will ensure the safety and preservation of our environment. Our newly appointed Sustainability Team that comprises of members in every area of operations will remain vigilant on the progress of this ambitious program.